"You're the only thing between [your] patients and death, and you're covered in cartoons"
June 2004 -- In "Nursing Image = Nursing Power," a provocative and constructive piece published in this month's issue of the Sacramento Bee's "Real Life Healthcare" magazine, Virginia gastroenterologist Patricia Raymond argues that nurses could empower their profession by ditching the "cartoon jackets" and working toward uniforms that would project "a powerful classy new image to reflect the nurses of today." Dr. Raymond suggests that nursing has an image problem with the public because "they can't see you" among all the different but similarly attired personnel in a modern hospital. That is certainly part of it, though of course the image problem has roots in the history of the profession and some general social and economic factors, including medicine's own extremely successful image campaign over recent decades, which has helped to reinforce the public's belief that physicians provide virtually all meaningful health care. 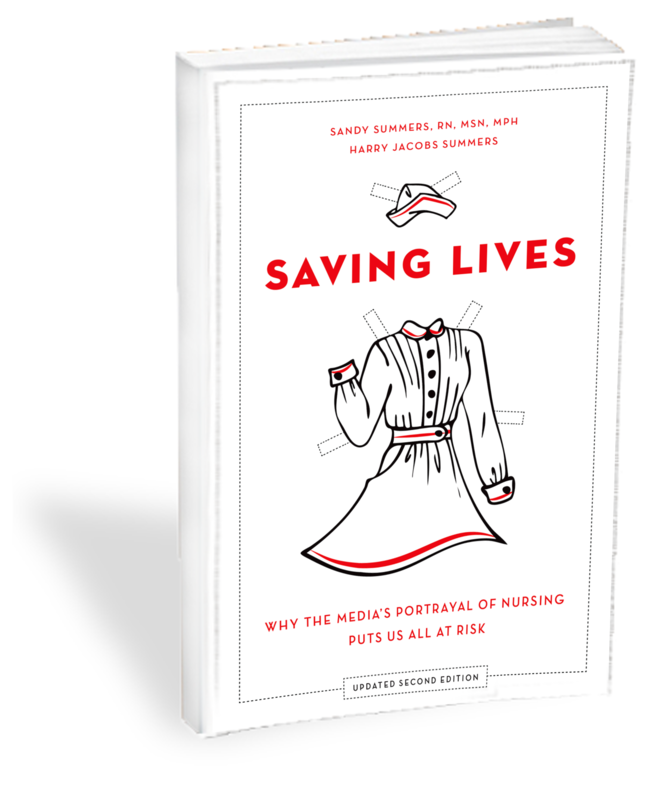 To address the nursing image issue, Dr. Raymond consults Fortune 500 "image consultant" Sandy Dumont, who "thinks it's time to resuscitate nursing uniforms," which Dumont believes will gain nurses "power and authority" and result in them being "taken more seriously." Dumont expresses contempt for "cartoon character jackets" ("no wonder [nurses] have no authority") and doubts about scrubs. Instead, she proposes something in a white, "easy-care modern fabric...tailored to enhance the figure, with both skirt and pant versions, and an informal as well as formal top portion, possibly with epaulets [which] could denote rank or station in the hospital." It's not clear whether Dumont would propose anything different for men, whose attire is not generally discussed in terms of "enhancing the figure." Dumont would not resurrect the cap. She argues that the benefits in increased respect would more than compensate for the loss in personal freedom, telling nurses that "[y]ou're the only thing between [your] patients and death, and you're covered in cartoons." Dr. Raymond's piece focuses in particular on how nurses' attire affects they way physicians view them. She argues that her colleagues would respect nurses more if they projected a more professional appearance, since physicians already "know that you're qualified." (Whatever the accuracy of that statement with regard to physicians generally, we're glad Dr. Raymond knows.) Dumont observes that nurses have "chosen to look silly in the doctor's eyes." Dr. Raymond explains nursing's "image problem" with physicians by noting that physicians, "moaning about overload of patient demands, don't see the qualified professionals eager to accept responsibility right beside us." We appreciate this insight, though we would note that most nurses today are far more eager to be given the time and resources to provide nursing care to their patients than they are to assume additional responsibilities from physicians; nurse short-staffing is a primary cause of the nursing shortage, and a public health crisis that is costing patients their lives. Dr. Raymond tells nurses forcefully that "[i]f you wish doctors to treat you as  colleagues in health care, society to acknowledge you as authorities and to be paid as your profession deserves, insist upon the image of a professional." She urges nurses to start locally, "[c]huck the cartoon jackets unless you're in pediatrics," and develop a uniform of "solid well-tailored scrubs" with a "starched white lab coat," "nursing pins and honors," and a "name badge with your last name and degrees," resisting the "belittling but friendly 'Suzie, R.N.' badge." Many would agree with her sentiments about "cartoon jackets"--even for pediatric nurses, since we haven't seen many pediatricians in cartoon uniforms. Many might also agree with the lab coat idea, since that coat is the recognized symbol of serious scientific professionals--not just physicians. Others might argue that such coats are also a significant source of infection--potentially draping into open wounds and unlikely to be washed every day--and it may be that all clinicians should consider alternatives to the coat. It could also be difficult to design a lab coat that would not get in the way of the constant hands-on work of nursing, which might result in coats rarely being worn near patients; taking the coat on and off could be too time consuming. In explaining nursing's image problem at the beginning of the piece, Dr. Raymond cites Michael Zwerdling's web site Zwerdling Nursing Archives, which contains many images of nursing stereotypes from the last century, and she notes that "the media continues to belittle and cheapen the image of your profession, an assault ably defended by Sandy Summers, MSN, MPH, RN, and the Executive Director of the Center for Nursing Advocacy (www.truthaboutnursing.org)." There are few easy answers in the ongoing debate about the future of the nursing uniform, but Dr. Raymond deserves credit for a thoughtful addition to the discussion, and for delivering a candid and useful message to nurses from their physician colleagues. See Patricia Raymond's article "Nursing Image = Nursing Power" in the June 2004 edition of the Sacramento Bee's "Real Life Healthcare." Also see an article by image consultant Sandy Dumont calling for the end of patterned nursing scrubs.